A librarian is an information professional trained in library and information science, which is the organization and management of information services or materials for those with information needs. Typically, librarians work in a public or college library, an elementary or secondary school media center, a library within a company, or another information-provision agency. Some librarians are independent entrepreneurs working as information specialists, catalogers, indexers and other professional, specialized capacities. Librarians may be categorized as a public, school, correctional, special, independent or academic librarian. Libraries have been adapting to changes in today's information environment. Since information management is vital to any organization, librarians today are required to have a high degree of diversified and specialized information management skills. The term librarian is used often and incorrectly to refer to anyone who works in a library. Para-professional or clerical staff working in a library are more properly referred to as library clerks, library assistants, or some equivalent title. Professional librarians (in the United States, Canada, Australia, and elsewhere) have achieved a Master of Science or of Arts degree at the graduate school level, requiring some 30 to 46 semester hours from an accredited school of library and/or information science with a college or university. As with most professional degrees, librarians may carry forward obligations to contribute to their profession through writing and publication, attendance at professional conferences, mentoring, etc. 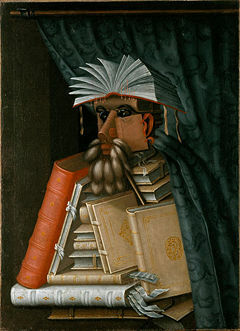 Traditionally, librarians have been associated with collections of books, as demonstrated by the etymology of the word "librarian" (< Latin liber, 'book'). However, modern librarians deal with information in many formats, including books, magazines, newspapers, audio recordings (both music recordings and audiobooks), video recordings, maps, photographs and other graphic material, bibliographic databases, and digital resources. Librarians often provide other information services, including computer training, coordination of public programs, basic literacy education, and help with finding and using community resources. In a library, there are many positions other than that of librarian. Such positions include library associate, library technician, library assistant, clerk, page, shelver, and volunteer. Other professional positions, such as manager, director or administrator, are often filled by librarians. In these positions, the worker may be given the title Administrator, Director, Manager or Librarian. Reference or research librarians help people doing research to find the information they need, through a structured conversation called a reference interview. The help may take the form of research on a specific question, providing direction on the use of databases and other electronic information resources; obtaining specialized materials from other sources; or providing access to and care of delicate or expensive materials. These services are sometimes provided by other library staff that have been given a certain amount of special training; some have criticized this trend. Technical service librarians work "behind the scenes" ordering library materials and database subscriptions, computers and other equipment, and supervise the cataloging and physical processing of new materials. Collections development librarians monitor the selection of books and electronic resources. Large libraries often use approval plans, which involve the librarian for a specific subject creating a profile that allows publishers to send relevant books to the library without any additional vetting. Librarians can then see those books when they arrive and decide if they will become part of the collection or not. All collections librarians also have a certain amount of funding to allow them to purchase books and materials that don't arrive via approval. Archivists can be specialized librarians who deal with archival materials, such as manuscripts, documents and records, though this varies from country to country, and there are other routes to the archival profession. Systems Librarians develop, troubleshoot and maintain library systems, including the library catalog and related systems. Electronic Resources Librarians manage the databases that libraries license from third-party vendors. School Librarians work in school libraries and perform duties as teachers, information technology specialists, and advocates for literacy. Outreach Librarians go out of their way to provide library and information services for underrepresented groups, such as people with disabilities, low income neighborhoods, homebound adults and seniors, incarcerated and ex-offenders, and homeless and rural communities. Experienced librarians may take administrative positions. Similar to management in any other organization, they are concerned with the long-term planning of the library, and its relationship with its parent organization (the city or county for a public library, the college/university for an academic library, or the organization served by a special library). Researching topics of interest for their constituencies. Referrals to other community organizations and government offices. Suggesting appropriate books ("readers' advisory") for children of different reading levels, and recommending novels for recreational reading. Supervising and promoting reading clubs. Developing programs for library users of all ages and backgrounds. Managing access to electronic information resources. Basic categories of workplace settings for librarians are routinely classified around the world as: public, academic, school, and special. Some librarians will start and operate their own business. They often call themselves information brokers, research specialists, knowledge management, competitive intelligence or independent information professionals. Below are the basic differences between the types of libraries. Public library: These institutions are created through legislation within the jurisdiction they serve. Accordingly, they are given certain benefits, such as taxpayer funding, but must adhere to service standards and meet a wide group of client needs. They are usually overseen by a board of directors or library commission from the community. Mission statements, service and collection policies are the fundamental administrative features of public libraries. Occasionally private lending libraries serve the public in the manner of public libraries. In the United States, public librarians and public libraries are represented by the Public Library Association. Academic library: Libraries that serve a post-secondary institution. Depending upon the institution, the library may serve a particular faculty or the entire institution. It is common to require an academic librarian to be fluent in two or more languages. Many different types, sizes, and collections are found in academic libraries and some academic librarians are specialists with advanced degrees in these areas of specialization, to adequately work with these collections and archives. A university librarian, or chief librarian, is responsible for the library within the college structure, and may also be called the Dean of Libraries. Some post-secondary institutions treat librarians as faculty, and they may be called professor or other academic ranks. Some universities make similar demands of academic librarians for research and professional service as are required of faculty. Academic librarians administer various levels of service and privilege to faculty, students, alumni and the public. School library media center: Libraries which exclusively serve the needs of a public or private school. The primary purpose is to support the students, teachers, and curriculum of the school or school district. In addition to library administration, certificated teacher-librarians instruct individual students, groups and classes, and faculty in effective research methods, often referred to as information literacy skills. Audio-visual equipment service and/or textbook circulation may also be included in a school librarian's responsibilities. Often, teacher-librarians are qualified teachers who take academic courses for school library certification and/or earn a Master's degree in Library Science. Special library: News, law, medical, music, Seminary, private, government, nongovernmental organization, prison, corporate, museum or any other type of library owned and operated by an organization are considered as special library. They can be highly specialized, serving a discrete user group with a restricted collection area. In an increasingly global and virtual workplace, many special librarians may not even work in a library at all but instead manage and facilitate the use of electronic collections. Funding for special libraries varies widely. Librarians in some types of special libraries may be required to have additional training, such as a law degree for a librarian in an academic law library or appropriate subject degrees for subject specialties such as chemistry, engineering, etc. Many belong to the Special Libraries Association. There are also more specific associations such as the American Association of Law Libraries, Art Libraries Society of North America, the Medical Library Association, or the Visual Resources Association,, and American Theological Library Association. It is common in academic and other research libraries to require the librarians to obtain Master's degrees in some academic subject, sometimes but not necessarily related to their professional responsibilities; in major research libraries, some of the librarians will hold Ph. D degrees in subject fields. Other advanced degrees often taken in conjunction with a degree in librarianship are law, management, health administration or public administration. Library associates, library technicians, and library assistants often have college diplomas but usually do not hold library-related degrees. Occasionally they also hold undergraduate or graduate degrees in other disciplines. These workers, sometimes referred to as para-professionals, perform duties such as database management, cataloging, ready reference, and serials and monograph processing. It is also possible to earn a doctorate in library and information science. Graduates with PhDs usually become part of the teaching faculty in schools of library and information science, or sometimes occupy the directorship or deanship of university libraries. Those undertaking research at the doctoral level can pursue a very wide range of interests including information technology, government information policy, social research into information use among particular segments of society, information in organizations and corporate settings, and the history of books and printing. In the United States and Canada, a librarian normally has a one or two-year master's degree in library and information science, library science or information science (called an MLS, MALIS, MSLS, MIS, MSIS, MS-LIS, MISt, MLIS, or MILS) from an accredited university. These degrees are accredited by the American Library Association and can have specializations within fields such as archiving, records management, information architecture, public librarianship, medical librarianship, law librarianship, special librarianship, academic librarianship, or school (K-12) librarianship. School librarians often are required to have a teaching credential, as well as a library science degree. Many, if not most, academic librarians also have a second, subject-based master's degree. In the UK and some other countries, a librarian can have a three- or four-year bachelor's degree in library and information studies or information science; separate master's degrees in librarianship, archive management, and records management are also available. In the United Kingdom, these degrees are accredited by the Chartered Institute of Library and Information Professionals and the Society of Archivists. In Germany and some other countries, the first step for an academic librarian is a Ph.D. in a subject field, followed by additional training in librarianship. In Australia, a professional librarian must meet the requirements set out by the Australian Library and Information Association (ALIA). There are three ways in which these requirements can be met: the individual must obtain an ALIA-recognized bachelor degree in library and information studies, complete a first degree in any discipline followed by an ALIA-recognized postgraduate diploma or masters course, or gain an ALIA-recognized library technician qualifications (undertaken at TAFE) followed by an ALIA-recognized bachelor degree in library and information studies. ALIA is responsible for accreditation of library specific qualifications for both librarians and library technicians. Professional Australian teacher-librarians require slightly different qualifications. In addition to having a degree that meets ALIA's accreditation process, teacher librarians must also hold recognized teaching qualifications. The two largest library associations in the United States are the American Library Association (ALA) and the Special Libraries Association. Many U.S. states have their own library association as well. Librarians may also join such organizations as the Association of College and Research Libraries and the Public Library Association and the Art Libraries Society. The Canadian Library Association serves Canada and there are provincial associations as well, such as the Ontario Library Association. In the United Kingdom, the professional body for Librarians is the Chartered Institute of Library and Information Professionals (formerly known as the Library Association). The International Federation of Library Associations and Institutions (IFLA) represents the interests of libraries and librarians internationally. Recent issues of concern for U.S. libraries include implementation of the Patriot Act and the Children's Internet Protection Act. Many librarians around the world share American librarians' concern over ethical issues surrounding censorship and privacy. Some librarians join activist organizations like the UK-based Information for Social Change and the North American-based Progressive Librarians Guild. Within the American Library Association (ALA), some also join the Social Responsibilities Round Table. SRRT came into being amid the social ferment of the 1960s and is often critical of the American Library Association for not living up to its professed ideals. Another important activist organization is the Social Responsibilities Special Interest Section of the American Association of Law Libraries (AALL). These activist organizations are viewed as controversial by some librarians, while others view them as a natural extension and outgrowth of their own deeply-held library ethics. The growing use of technology in libraries has a significant impact on the roles of librarians. New technologies, such as open url, are dramatically increasing the accessibility of information and librarians must adapt to the evolving needs of users that emerge from the adoption of these new technologies. The most significant example of how technology has changed the role of librarians in the last 50 years has been the move from traditional card catalogs to online public access catalogs (OPACs). Librarians had to develop software and set the MARC standards for cataloguing records electronically. The same could be said of other technology developments, from electronic databases (including the Internet), to logistical functions such as bar codes (or in the near future RFID). Many librarians provide virtual reference services (via web-based chat, instant messaging, text messaging, and e-mail), work in digitization initiatives for works in the public domain, teach technology classes to their users, and work on the development of information architecture for improving access and search functionality. These examples illustrate some of the ways in which librarians are using technology to fulfill and expand their historical roles. Librarians must continually adapt to new formats for information, such as electronic journals and e-books, which present both challenges and opportunities in providing access and promoting them to library patrons. Increasing technological advance has presented the possibility of automating some aspects of traditional libraries. In 2004 a group of researchers in Spain developed the UJI Online Robot. This robot is able to navigate the library, look for the specified book, and upon its discovery, carefully take it from the shelf and deliver it to the user. Because of the robot's extremely limited function, its introduction into libraries poses little risk of the employment of librarians, whose duties are not defined by menial tasks such as the retrieval of books. ↑ 1.0 1.1 Become a Librarian! Central Jersey Regional Library Cooperative Retrieved October 15, 2008. ↑ Steve McKinzie, "For Ethical Reference, Pare the Paraprofessionals." American Libraries 33 (9) (Oct 2002):42 Retrieved October 15, 2008. ↑ Public Library Association. American Library Association Retrieved October 15, 2008. ↑ 4.0 4.1 Special Libraries Association. Retrieved October 15, 2008. ↑ The American Association of Law Libraries Retrieved October 15, 2008. ↑ Art Libraries Society of North America Retrieved October 15, 2008. ↑ Medical Library Association Retrieved October 15, 2008. ↑ Visual Resources Association - The International Association of Image Media Professionals Retrieved October 15, 2008. ↑ American Theological Library Association. Retrieved October 15, 2008. ↑ Society of Archivists Retrieved October 15, 2008. ↑ Librarian. Australian Library and Information Association, 2006-08-10 Retrieved October 15, 2008. ↑ Teacher-Librarian 2008-06-24 Australian Library and Information Association Retrieved October 15, 2008. ↑ ACRL Retrieved October 15, 2008. ↑ Ala | Pla Retrieved October 15, 2008. ↑ CILIP | The Chartered Institute of Library and Information Professionals Retrieved October 15, 2008. ↑ IFLA - The official website of the International Federation of Library Associations and Institutions Retrieved October 15, 2008. ↑ Information for Social Change Journal (ISC) Retrieved October 15, 2008. ↑ Progressive Librarians Guild Retrieved October 15, 2008. ↑ Srrt - Ala Retrieved October 15, 2008. ↑ AALL, Social Responsibilities SIS Home Page Retrieved October 15, 2008. Janes, J. 2008. "INTERNET LIBRARIAN: Keeping Up." American Libraries 39 (4): 33-33. This page was last modified on 5 July 2018, at 18:45.